Town boss Nathan Jones didn’t think it was any fluke that his side are now joint top scorers in the league. 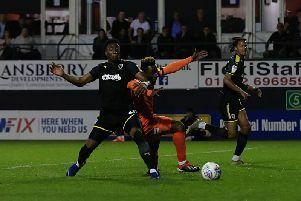 The Hatters’ 3-1 win at Gillingham on Saturday and subsequent 4-0 thrashing of Bradford in midweek made it 39 goals netted by Luton this season, level with Sunderland. If we’re clinical, in most games, the chances we get, we could be scoring four, five goals every week. On the achievement, Jones said: “It’s continuing from last year. We work religiously on our attacking play, so I can’t say it’s fluke or luck, as we recruit that way. “In terms of the midfield players we bring in, Jorge Grant we added, who was a 19, 20 goal midfield player last year, so we want to score goals. “We’re developing Harry Cornick into a front man, so we’re a work in progress. After beginning the campaign with 10 goals from their opening nine games, the Hatters have moved effortlessly through the gears, notching 29 in their last 11. Midfielder Andrew Shinine, who has contributed four so far, said: “At the start of the season, we had chances that we didn’t take. “I think there were a few grumbles that we weren’t scoring enough goals or we didn’t have the players. “That can happen in football, if you have a little bit of a dip, people can have a go at you, but we’re absolutely banging the goals in like last year now. “If we’re clinical, in most games, the chances we get, we could be scoring four, five goals every week. Meanwhile, top scorer Elliot Lee, now into double figures for the campaign, added: “Shins is popping up with goals, I think everyone but Sonny (Bradley) has scored in the team.